In 2013 Disgraced by Ayad Akhtar won the Pulitzer Prize for Drama. Compared with other Pulitzer Prize winners, it is not epic like the 1993 winner, Tony Kushner’s Angels in America, Part 1, or the 2009 winner, Lynn Nottage’s Ruined. Neither is it dramatically innovative like the 1994 winner, Edward Albee’s Three Tall Women, or the 2002 winner Suzan-Lori Parks’s Topdog/Underdog. Rather it takes a structure, overused in American drama, of the the dinner party gone wrong and infuses it with subject matter not previously discussed in a Broadway play. Broadway has seen depictions of self-loathing among all sorts of groups of people – gay, black, Catholic, Jewish, etc. What is new in Disgraced, and just about all that is new, is Akhtar’s depiction of Muslim-American self-loathing. At the centre of the story is Amir Kapoor (Raoul Bhaneja), a mergers and acquisitions lawyer born in the U.S. to immigrant parents from the subcontinent and raised Muslim, who hopes soon to be made a partner in his law firm. His wife Emily (Birgitte Solem) is an artist who currently has been drawing her inspiration from Islamic art, especially Islamic tilework, for her colourful abstract paintings. She says she loves the notion of submission to an ideal that Islamic art represents. Nevertheless, Emily has not lost her ability to do figurative painting. The play opens with Emily in the process of painting Amir’s portrait in imitation of Velázquez’s portrait from 1650 of his apprentice and slave, the Moor Juan de Pareja, whom Velázquez later freed. Velázquez’s portrait shows the slave clad in the lace collar of a nobleman looking out with an indefinable expression between doubt and pride. No points for guessing that Akhtar is drawing a comparison between Juan de Pareja, the slave in fine clothing, and the Muslim-American Amir Kapoor. Akhtar gives Amir a nephew (Ali Momen) who has changed his name from Hussein Malik to Abe Jensen to hide his faith from others. Despite this, Abe wants Amir to advise a local imam whom Abe thinks has been falsely arrested on charges of financing terrorist groups. Amir goes to the imam’s hearing at Emily’s insistence, but when Amir is quoted in the New York Times and the name of his law firm is mentioned, Amir knows he is in trouble. The play climaxes in a dinner party to celebrate the inclusion of Emily’s paintings in an exhibition held by the Jewish art dealer Isaac (Michael Rubenfeld). Amir is in a bad mood because the partners have called him in to explain why he lied about his parents’ background when he applied for the his job. A reminder of work appears at the party in the form of Isaac’s African-American wife Jory (Karen Glave) who happens to be one of Amir’s colleagues at the firm. The dinner party thus results in the meeting of two couples in racially mixed marriages where both husbands do not practise the faith the were raised in. The set-up – with a WASP, an African-American, a Jew and an ex-Muslim – is something one could imagine in a Second City sketch because it is so obviously schematic. Disgraced, however, has pretensions to tragedy, but still when the arguments break out they do so along totally predictable lines. himself an apostate in relation to Islam, Amir should have no quarrel with Isaac as they both eat the pork tenderloin that Emily has so blithely prepared for them. Yet, it is when the discussion turns to the Middle East that tensions erupt between Amir and Isaac, who, despite their obvious secularism, immediately fall into defence of the sides in the conflict based on the faiths they don’t practise. This results in name-calling and insults with Amir even calling Jory and then himself the N-word. Naturally the party breaks up. What Akhtar is portraying here is ativism. In her play God of Carnage (2006), Yasmina Reza did the same thing when she has her two couples gradually throw off the veneer of civilization to reveal the raving savage underneath. Her play is, of course, a comedy. In Disgraced, Akhtar wants us to take seriously the notion that two men who do not practice their birth religions are still so inextricably tied to them that when attacked they will revert to defending them (even though Amir has begun by attacking Islam himself). This is nonsense. Akhtar seems to suggest that “Once a Muslim, always a Muslim; once a Jew, always a Jew”. The problem is that if you believe that, you also have to believe no conversion from one religion to another is sincere. Does that mean Cat Stevens and Muhammed Ali really still Christian despite their conversion to Islam? Was Maureen Forrester and is Kate Capshaw (Steven Spielberg’s wife) still really Christian despite their conversion to Judaism? Were G.K. Chesterton’s and T.S. Eliot’s conversions to Catholicism not sincere? Akhtar’s play thus takes the regressive view that religion is somehow bred in the bone, and he reinforces this with the story of Abe, who later reverts to “Hussein”. After being picked up by the FBI when he is overheard supporting Islam, he tells the FBI that he is not a supporter of terrorism. To Amir, however, he expresses the jihadist notion that Islam should reconquer all the territory it held at the height of the Caliphate (750ad). Akhtar is suggesting through this shorthand that Hussein’s detention by the FBI has radicalized him. The point of the entire play seems to be that all of Amir’s troubles stem from his trying to conceal his “true” nature. Akhtar has not written characters as much as carriers of positions he wants to display. Thus, he invents an unconvincing affair for Emily apparently just for Amir to confront. This allows Akhtar to show that Amir under pressure reverts to the teaching of the Koran that allows husbands to beat their wives, even though Amir had just repudiated a section of the Koran earlier that evening. Given the shallowness of the characters, the actors have to work hard to round them out. 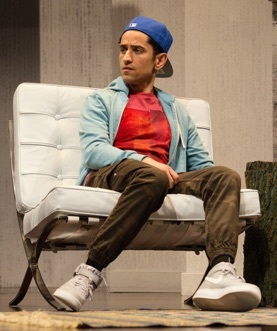 Raoul Bhaneja is good at playing Amir’s self-assuredness and anger but could stand to bring out other emotions in the character like distress, depression and remorse. Amir’s fall from grace is obviously meant to be the focus of the play, but Bhaneja doesn’t give us much information on how much Amir realizes that the fall is his own doing. We tend to think at the end that he is still blaming the ingrained prejudice of others, which is indeed one part of his fall, without seeing that his own assimilationist attitude is also involved. Birgitte Solem has the difficult job of making Emily not sound like a dilettante, but she manages to give Emily’s explanation of why Islamic art inspires her enough authority and passion that she convinces us of Emily’s sound judgement. Akhtar avoids, however, having Emily explain why she has not found inspiration in the religious art of her own Christian background, a topic that might have give us an even greater sense of her character. Michael Rubenfeld gives Isaac a strangely ineffectual demeanour, perhaps because he thinks that somehow captures the nature of an art dealer. Yet, the strength of Isaac’s intellectual explanations of how modern artists are trying to bring the sacred back into art shows that Isaac has a keener mind that Rubenfeld’s portrayal would suggest. We meet Karen Glave’s Jory last of all the characters, yet she makes sure her character makes an impact. Glave uses Jory’s ability to joke, her quickness of response and her ease in brushing off her husband’s criticisms to project a strong personality, one stronger than Isaac’s and easily the match for Amir’s. scene in Act 2 wearing a taqiyah instead of a ball cap and describing his encounter with the FBI seems less a surprise than a natural development of his more public embrace of Islam that we sensed in Act 1. Akhtar mentions a whole slew of people, places and concepts that have been in recent news like the 9/11 attacks, racial profiling, airline security checks, the U.S.’s having trained Al-Qaeda to fight the Taliban, Muslim fundamentalism, and so forth. This gives the play the appearance of being extraordinarily up-to-date and daring. Yet, all of these allusions remain merely allusions because Akhtar never explores any of them in depth. The most interesting line in the entire play is the quotation from Henry Kissinger that Jory says hangs on the wall in her office: “If I had to choose between justice and disorder, on the one hand, and injustice and order, on the other, I would always choose the latter”. There is so much related to government and religion that Akhtar could have had his characters bring out in debating this statement, yet all Akhtar does is to have Emily say she is for order and Jory say she is for justice, and then the discussion is over. 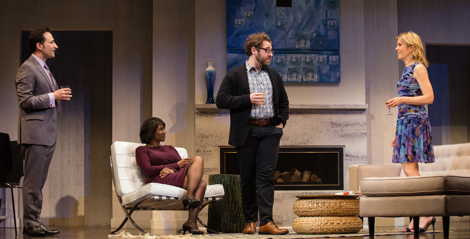 Disgraced is Ayad Akhtar’s first play and it has all the awkwardness of a typical first play where entrances and exits are not always well motivated and where ideas have not been fully integrated into characters. Another sign is the abruptness of the ending which prevents Emily and Amir from ever discussing in detail why they are breaking up. We’re meant to think that Amir’s striking Emily is reason enough, but we really should know more whether Amir understood why he acted as he did and what the physical abuse told Emily about Amir’s personality. Akhtar denies us these insights and in so doing denies his characters a potentially powerful and enlightening encounter. Flawed as it is, Disgraced has the great virtue of putting Muslim-American characters on stage in a mainstream play and at least bringing up important topics that still swirl about in the the daily news. The message of Disgraced seems to be the old one that people should be true to themselves and seems to show that Amir fails because his denial of his background makes him duplicitous. Yet, when Akhtar shows us what happens when Amir reverts to his “background” through anti-Jewish remarks and wife-beating the results are ugly. The best thing that Disgraced will do is to become a literary focus for debate on important and uncomfortable topics. If it does nothing else, the play will have served a useful purpose. Photos: (from top) Raoul Bhaneja, Karen Glave, Michael Rubenfeld and Birgitte Solem; Raoul Bhaneja; Ali Momen. ©2016 Cylla von Tiedmann.